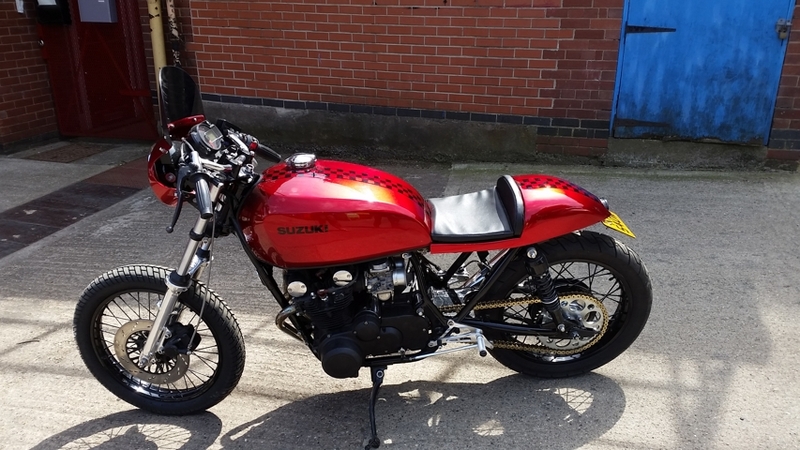 GS550 Cafe Racer in Candy Red with Darker Painted Decals and Chequers. This bike was freshly built to showcase our products. Everything on this bike is new including the Wheel Bearings, Head Stock Bearings, Chains, Sprockets, Tyres and Shocks. We also fitted an Electronic Dash, Lithium Ion Battery, our T-Back Seat, our Manx Norton Fairing, Wiring Loom, Under Tray, our Endurance Style Exhaust and our Rear Sets. The Frame, Wheels, Swinging Arm, Yokes, Stand and all the Brackets were Powder-Coated Gloss Black. Once again we spared no expense to make this bike look beautiful and our hard work paid off as this bike is now sold!